Quality engineers should have quality resumes. 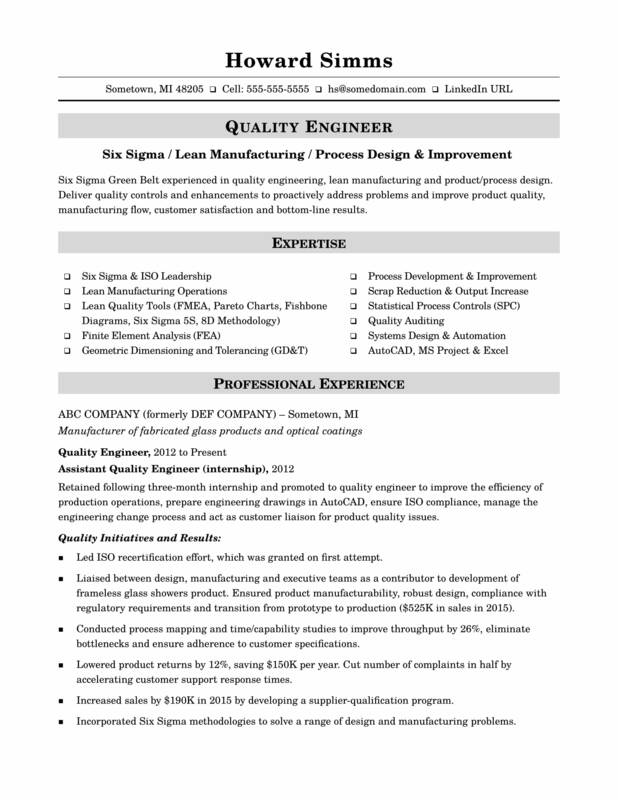 Check out this sample for a manufacturing quality engineer to see how you can improve your resume. The results of your quality engineering initiatives should stand out on your resume, says resume expert Kim Isaacs. Check out this sample resume she created below for a manufacturing quality engineer to learn how you can improve the quality of your resume. You can also download the midlevel quality engineer resume template in Word. And if you need more help, get a free resume evaluation from the experts at Monster's Resume Writing Service. Jobs for quality engineers are projected to grow by 10% (or 25,100 jobs) from 2016 through 2026, which is faster than average, according to the Bureau of Labor Statistics (BLS). You'll find the highest level of employment for this job in the following states: Michigan, California, Texas, Ohio, and Illinois; and in the following metropolitan areas: Warren, MI; Minneapolis; Los Angeles, Chicago; and Detroit. As an quality engineer, you can expect to earn a median wage of $85,880 per year, or $41.29 per hour, according to the BLS. Additionally, you can search for quality engineer jobs on Monster. Six Sigma Green Belt offering three years of experience in quality engineering, lean manufacturing and product/process design. Deliver quality controls and enhancements to proactively address problems and improve product quality, manufacturing flow, customer satisfaction and bottom-line results. Retained following three-month internship and promoted to quality engineer to improve the efficiency of production operations, prepare engineering drawings in AutoCAD, ensure ISO compliance, manage the engineering change process and act as customer liaison for product quality issues. Led ISO recertification effort, which was granted on first attempt. Liaised between design, manufacturing and executive teams as a contributor to development of frameless glass showers product. Ensured product manufacturability, robust design, compliance with regulatory requirements and transition from prototype to production ($525K in sales in 2015). Conducted process mapping and time/capability studies to improve throughput by 26%, eliminate bottlenecks and ensure adherence to customer specifications. Lowered product returns by 12%, saving $150K per year. Cut number of complaints in half by accelerating customer support response times. Increased sales by $190K in 2015 by developing a supplier-qualification program. Incorporated Six Sigma methodologies to solve a range of design and manufacturing problems.